WSO2 WSAS 3.0-alpha2 is now available for download. This version of WSO2 WSAS is based on revolutionary the WSO2 Carbon framework. Do try it out and give us your early feedback. The process of Carbonizing the Mashup Server will start soon... Stay tuned for more news on the revolutionary Carbon framework from WSO2. Well I've been very quite this month. That has been due to several reasons. To start off with it was Apchecon 2008 (I'm still to write about the fabulous experience it Apachecon) and then it was the WSO2 WSAS releases. We released alpha1 last week and followed it up by releasing alpha2 this week. I'm back home after a great week at ApacheCon in New Orleans. It was a fun-packed week with some really good sessions, excellent keynotes and of course really late nights :). Trying to get all the mail out of the way, its amazing how much you fall behind on just because of a week. I plan to post some writings on ApacheCon 2008 and the great times at New Orleans in the coming days. Stay tuned... (There is so much to write about, cant imagine where I should start ;)). I arrived in New Orleans a couple of days ago in order to attend ApacheCon 2008. My route to New Orleans was not that different from the one I took to Phoenix a couple of months back. 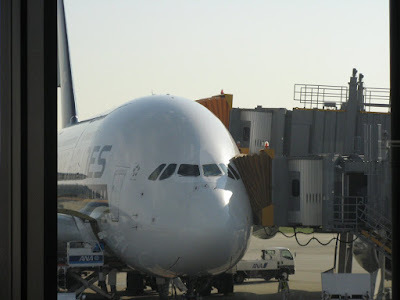 The route was Colombo - > Singapore -> Narita - > Dallas -> New Orleans, with a total travel time of around 37 hours. 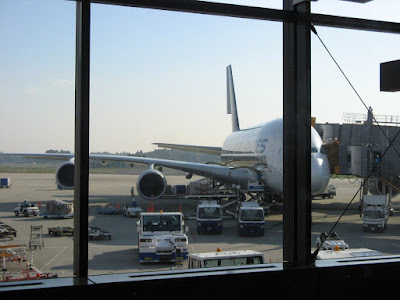 What was most interesting about the trip was that I was on a A380 from Singapore to Narita. This was my first time on this monster and it was a nice experience. One thing that I did notice was tat it had more leg space than the other aircrafts. Also I love taking Singapore Airlines because of its entertainment system. There audio entertainment includes the UK top 10 charts from the 50s to date. I'm a huge fan of 70's and 80's music. I could listen to it all day and still want more... One of my most loved tracks is "Long Haired Lover from Liverpool" by Lt Jimmy Osmond. Note : New Orleans is CST or UTC/GMT -6 hours.